Senators Kennedy and Whitehouse have sent a letter to U.S. Attorney General Alberto Gonzales demanding a probe by the DoJ's Office of the Inspector General and Office of Professional Responsibility into "allegations that the Republican National Committee engaged in 'vote caging' during the 2004 elections." The letter, sent today to Gonzales, also requests an investigation into "whether any Department officials were aware of allegations that Tim Griffin had engaged in caging when he was appointed United States Attorney for the Eastern District of Arkansas, and whether appropriate action was taken." The complete letter and a press release sent along with it are posted in full at the end of this article. "The Republican Party has a long and ignominious record of caging – much of it focused on the African American community," Kennedy and Whitehouse explain in their letter which gives details of the RNC using voting caging tactics to suppress minority voters in both 1981 and 1986. After both incidents, the GOP had signed consent decrees that they would not engage in the activity in the future. Nonetheless, email evidence has shown that in 2004, Tim Griffin created and sent caging lists on behalf of the Bush 2004 campaign as originally reported by the BBC to little American media fanfare, prior to the election. Griffin, who became an aide to Karl Rove, was later appointed by the Bush Administration as the US Attorney from Arkansas after they had fired Bud Cummins. Griffin has since resigned from the post in the wake of the scandal. 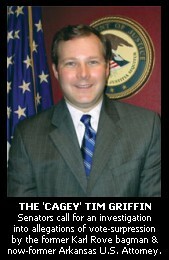 In recent testimony before the House Judiciary Committee, the now-resigned DoJ liason to the White House, Monica Goodling, admitted that now-resigned Deputy Atty General Paul McNulty was less than forthcoming in his sworn Congressional testimony concerning his knowledge about Griffin's involvement in vote caging during the 2004 campaign. In her testimony, given under a grant of immunity from prosecution, Goodling said that McNulty "failed to disclose that he had some knowledge of allegations that Tim Griffin had been involved in vote "caging" during his work on the President's 2004 campaign." 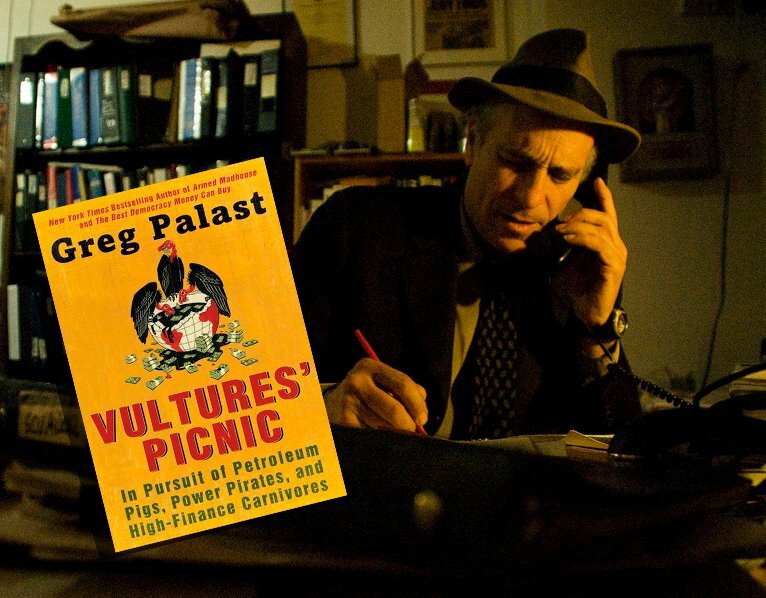 Reporter Greg Palast, who initially covered the story for the BBC and charged that the lists were meant to target minority voters --- many of whom were serving in the armed forces overseas in Iraq --- has opined on Goodling's admissions in an exclusive to The BRAD BLOG filed just after her testimony. Yesterday, in another BRAD BLOG exclusive, Palast discussed the recent firing of Griffin and a recent teary-eyed speech given last week in Arkansas. "This is all made up of whole cloth," Griffin told the assembled crowd during a Q&A session after a speech punctuated by tears. "I didn’t cage votes," he claimed. That, despite the emails he sent in 2004 with spreadsheets listing voters attached along with the subject line "Re: caging." "Caging is a reprehensible voter suppression tactic, and it may also violate federal law and the terms of applicable judicially enforceable consent decrees," the senators charge in their letter. "It is very disturbing to think that Department officials may have approved the appointment of a United States Attorney knowing that he had engaged in racially targeted vote caging," write the senators. "Moreover, it is very disturbing to think that senior officials were aware of this practice and did nothing to refer their information to relevant officials within the Department for investigation and a determination as to whether it was a violation of a consent decree or law within the Department’s jurisdiction to enforce." The letter from the senators, both of whom are members of the Senate Judiciary Committee, which has been investigating elements of the U.S. Attorneys Purge, concludes, "At a time when the Department’s political independence and its commitment to enforcement of civil rights statutes have been called into doubt, it is vitally important that the Department thoroughly investigate these allegations of unlawful voter suppression, and the apparent failure of Department employees to forward to the appropriate authorities information they had about this practice."